Chinese smartphone maker ZTE will pay a fine of $1 billion and bring an American monitoring team on board to resolve a high-profile dispute with the United States. 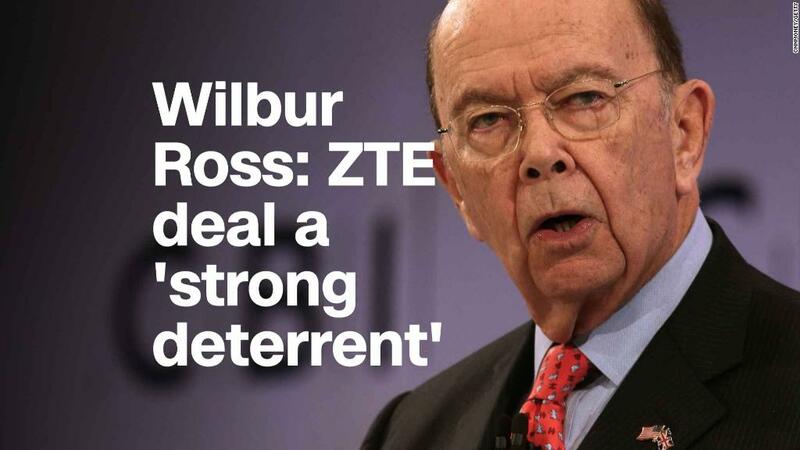 The deal, announced by US Commerce Secretary Wilbur Ross, will mean the end of a ban on ZTE buying American parts, provided the state-controlled company sticks to the terms. Ross said the deal was struck at around 6 a.m. ET on Thursday, and it will impose "the most strict compliance that we've ever had on any company, American or foreign." ZTE will also put $400 million in an escrow account. The fate of the company has become a major flashpoint in trade tensions between the United States and China. In April, the US Commerce Department blocked American firms from selling parts or providing services to ZTE, which also makes telecommunications equipment. The crippling ban was put in place after Washington said ZTE violated a 2017 deal in which the Chinese company admitted to evading sanctions on Iran and North Korea. "Prior administrations have been real patsies for the Chinese and for other countries. They've never really pushed back," Ross said. "So I think the Chinese are well aware there's a new marshal in town and it's called Donald J. Trump, and he's a very, very good shot." But the deal came under fire from Senator Chuck Schumer, who accused President Trump of shooting "blanks" at China while aiming his trade fire at allies such as Europe and Canada. "There is absolutely no good reason that ZTE should get a second chance, and this decision marks a 180-degree turn away from the president's promise to be tough on China," he said in a statement. The new agreement will force ZTE (ZTCOF) to replace its top management and board, Ross said. The compliance team will report to the company's new chairman, he added. A ZTE spokesperson did not immediately respond to a request for comment. The $400 million will be forfeited, and the ban reimposed, if ZTE violates the terms during a 10-year probationary period. "I'm very, very happy with this arrangement," Ross said. "It is the strictest and largest fine that has ever been brought by the Commerce Department." ZTE, which employs around 75,000 people worldwide, buys key components from a range of US companies, including chips from Qualcomm (QCOM) and Intel (INTC). It said on May 9 that it had halted most of its operations because of the ban. President Donald Trump announced in mid-May that he was working with Chinese President Xi Jinping to give ZTE "a way to get back into business, fast." But his remarks unleashed a backlash in Washington that fueled uncertainty over whether the company would ever get a reprieve. Analysts say the ban is likely to have cost ZTE billions of dollars in lost revenue, tarnished its brand and strained its relationships with customers around the world. ZTE has repeatedly come under the scrutiny of regulators and officials in the United States, which is wary of its ties to the Chinese government. The company's controlling shareholder is Shenzhen Zhongxingxin Telecommunications Equipment, a Chinese state-owned corporation. In 2012, ZTE and Huawei, another huge Chinese tech company, were the subject of a US congressional report that focused on the equipment they make for telecommunications networks. The report said the companies "cannot be trusted to be free of foreign state influence and thus pose a security threat to the United States and to our systems." Both companies strongly disputed the report's findings. China's efforts to boost its high-tech industries are a key source of tension between the two countries. And ZTE plays a role in Beijing's tech ambitions. It is one of several Chinese tech firms aggressively pursuing the development of 5G, the next generation in wireless network technology. The company boasts government and corporate clients in more than 160 countries and regions. -- Erin McClam contributed reporting.